The Fulton County Board of Developmental Disabilities recently received a three-year accreditation from the Ohio Department of Developmental Disabilities. This award followed a comprehensive review of all aspects of county board services and programs including Early Intervention, Service and Support Administration (SSA) Services, behavior support, and staff training and certification. 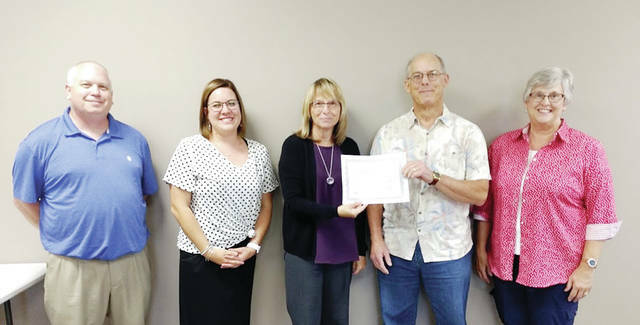 The certificate was presented to Board President Mike Oricko by Superintendent Beth Friess, as well as board members Mark Shadbolt, Lynlee Reinking, and Shirley Colon at the board’s August meeting. Pictured L-R: Mark Shadbolt, Lynlee Reinking, Beth Friess, Mike Oricko and Shirley Colon. The Fulton County Board of Developmental Disabilities recently received a three-year accreditation from the Ohio Department of Developmental Disabilities. This award followed a comprehensive review of all aspects of county board services and programs including Early Intervention, Service and Support Administration (SSA) Services, behavior support, and staff training and certification. The certificate was presented to Board President Mike Oricko by Superintendent Beth Friess, as well as board members Mark Shadbolt, Lynlee Reinking, and Shirley Colon at the board’s August meeting. Pictured L-R: Mark Shadbolt, Lynlee Reinking, Beth Friess, Mike Oricko and Shirley Colon. https://www.swantonenterprise.com/wp-content/uploads/sites/23/2018/09/web1_DD-accreditation.jpgThe Fulton County Board of Developmental Disabilities recently received a three-year accreditation from the Ohio Department of Developmental Disabilities. This award followed a comprehensive review of all aspects of county board services and programs including Early Intervention, Service and Support Administration (SSA) Services, behavior support, and staff training and certification. The certificate was presented to Board President Mike Oricko by Superintendent Beth Friess, as well as board members Mark Shadbolt, Lynlee Reinking, and Shirley Colon at the board’s August meeting. Pictured L-R: Mark Shadbolt, Lynlee Reinking, Beth Friess, Mike Oricko and Shirley Colon.